Watch the video, its worth the time. I jump back and forth between windows, linux, and OSX every day. Without Cygin Windows would be unbearable. 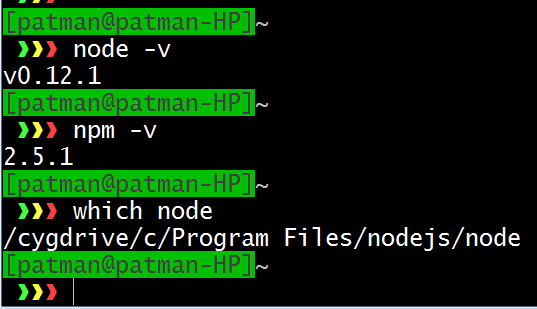 I'm going to get node working with Cygwin. 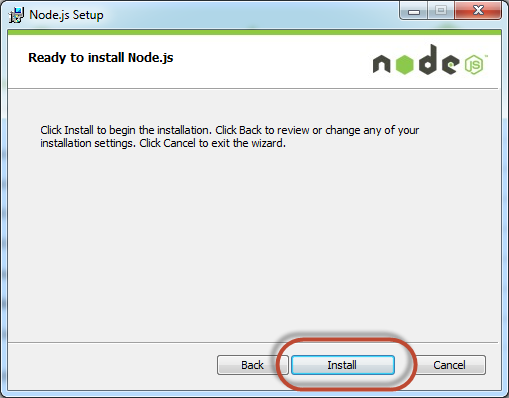 According to this page https://github.com/joyent/node/wiki/Installation#building-on-cygwin  they stopped supporting cywin, they do have a deploy for build 0.4.12 which seems too far out of date to use, however can it be compiled and deployed by hand? Looking around a bit it seems this may be a very hard, so for now I am going to give up my dream of running it natively in Cygwin and just do the Windows MSI install and have cygwin use that. 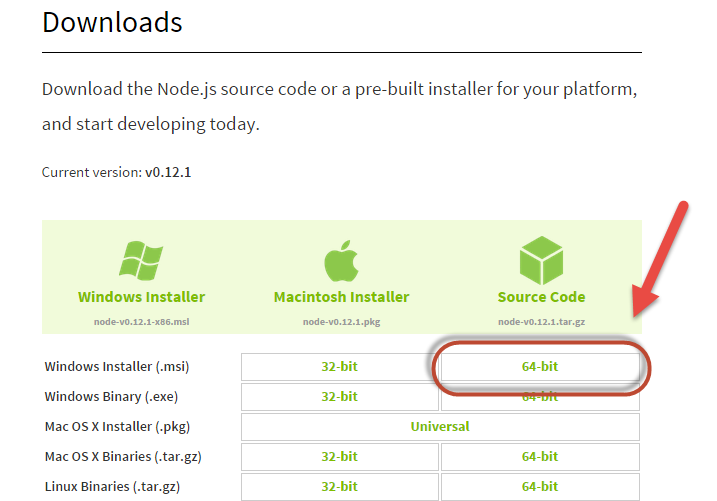 Download the Windows installer, I am on a 64-bit machine so I am going to download the 64-bit version. After it downloads run it. Use brew to install it. OK, not the latest version, can I get 0.12 installed via Brew? 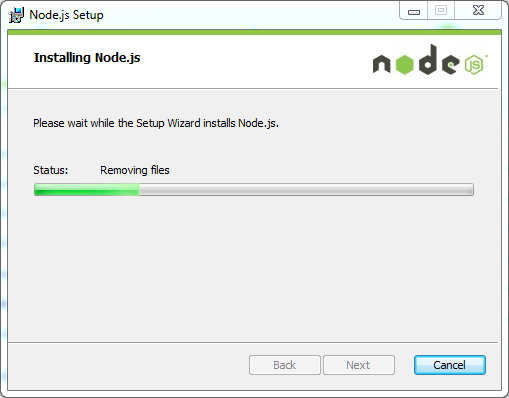 This install nodejs at /usr/bin/nodejs, I would rather have it at /usr/bin/node so I need to make a link. OK these are older versions, how do I install the new ones in Ubuntu 14.04? 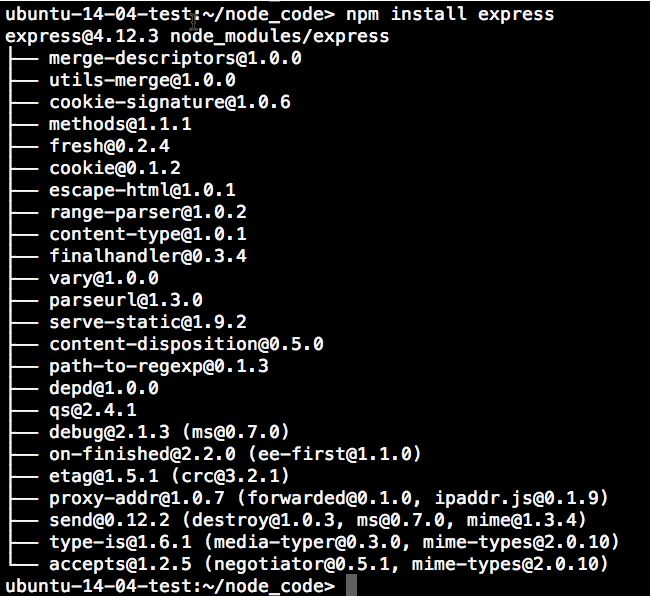 OK that did not get me npm 2.6.0, but I don't think I need it per-se so I am going to leave it as is and call it good. 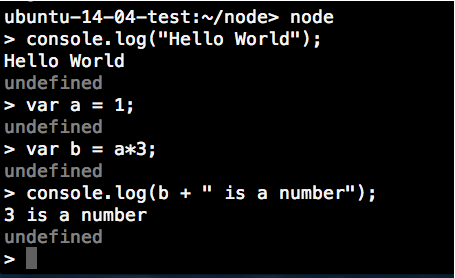 OK, now for some simple hello world programming. 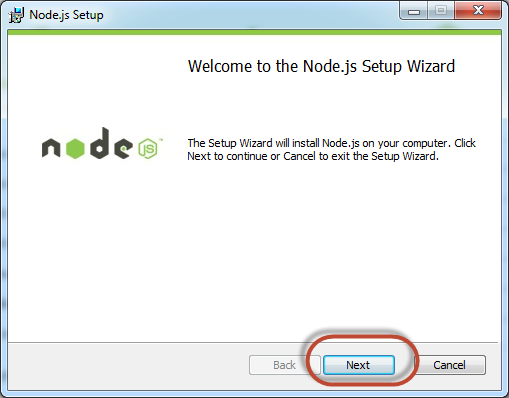 You can run node.js interactively. Save the file and now run it with the following command. 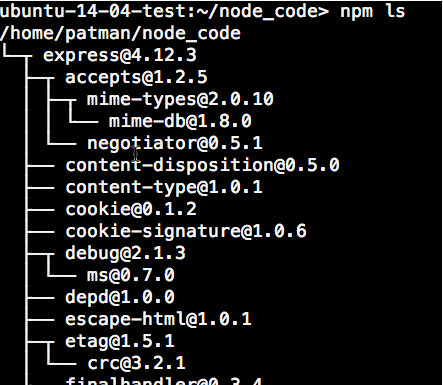 NPM is our node packet manager. 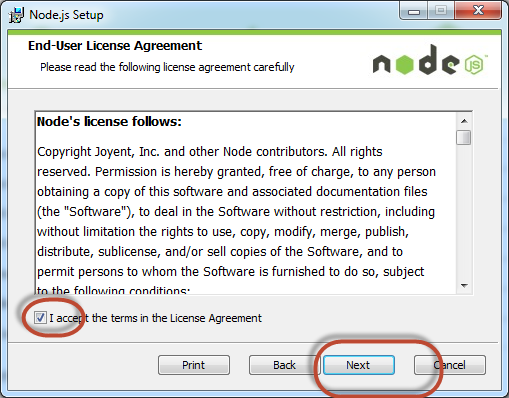 It's a tool that allows us to easily bring in other libraries and manage any dependencies your code may have. I am going to make a project folder and start importing a module or two. 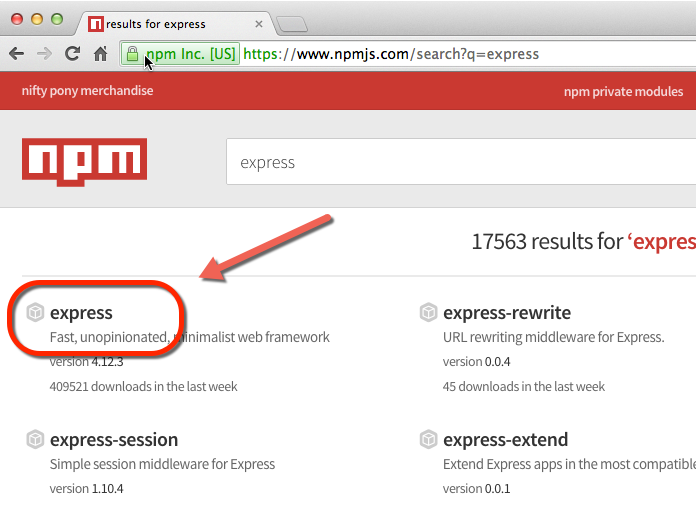 To search for packages you can go here https://www.npmjs.com/  and search for a package. I ran a search for express and this is what I came up with. 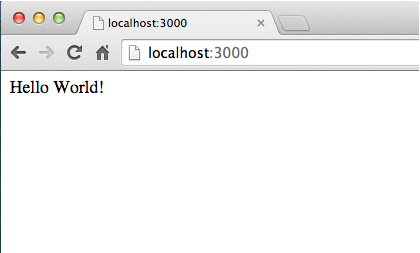 Express is a minimal web framework. I get back more interesting results now. 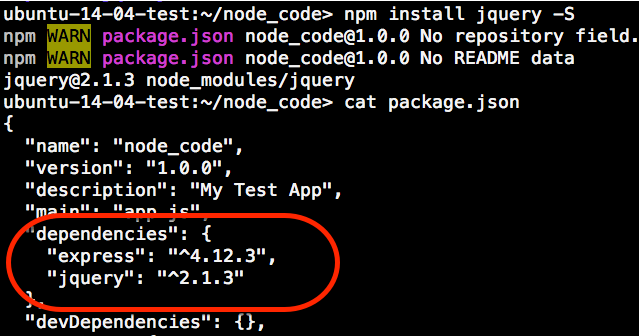 There is a better way to handle your project's dependencies, the package.json file. To create this file run the following command. 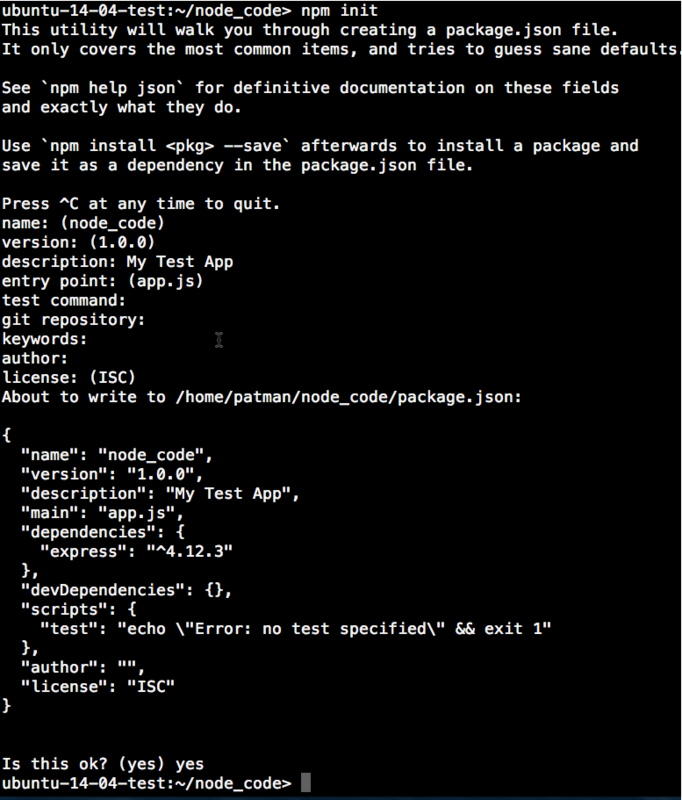 This walks you through the creation of the package.json file with a few prompts. You can see here it already found our dependencies we had set up before. What about if/when I want to add another module? 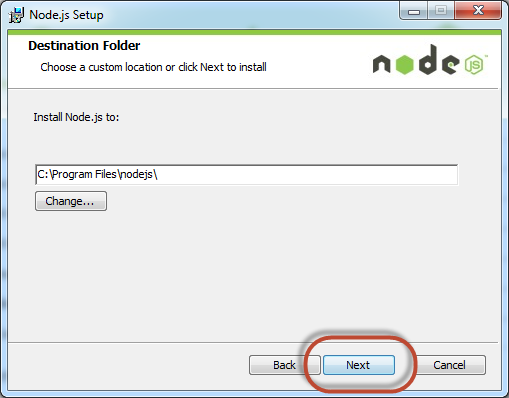 It will install the module in the node_code folder, but it won't update the package.json file. 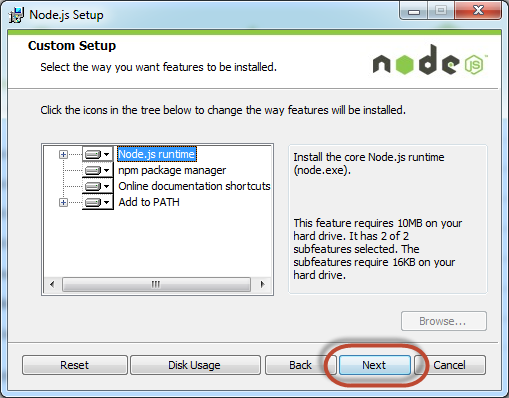 To have it auto update package.json use the -S flag. 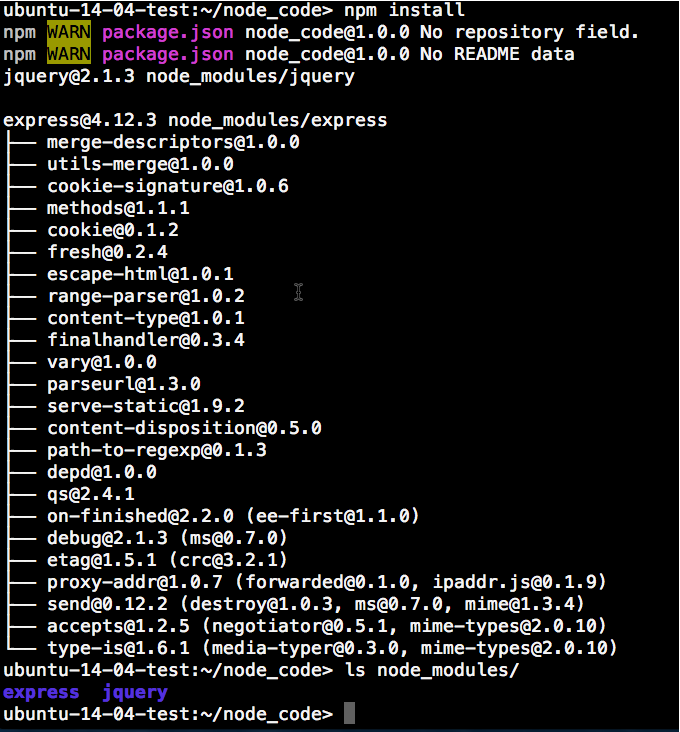 Wipe the node_modules folder and run "npm install"
Now that is done, I am going to write a very simple express program and run it. I don't want to go any deeper into Express in this document, I will save that for a later post. But for now I have a very basic node express server running. 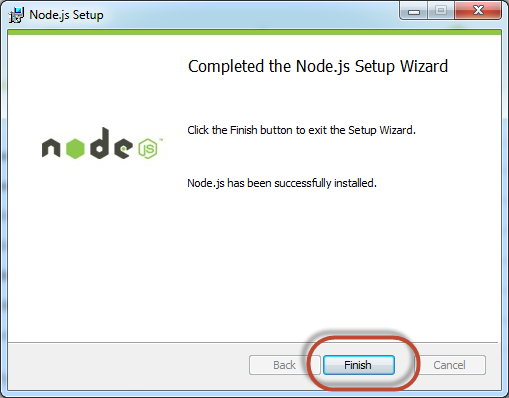 Now that I have node and npm installed I want to poke around a bit to see what it can do. One thing I want to do is interact with the linux shell. I want to run a simple command and get some data back.